One of my favorite genres is the heist film, which gives filmmakers the chance to develop inventive, complex sequences while exploring the criminal mind. When done well, they’re also highly entertaining and the epitome of cool. I’ve seen many of the classics, but there still were plenty of interesting choices for this marathon. My first selection is 1956’s The Killing, an early gem from the legendary Stanley Kubrick. Johnny Clay (Sterling Hayden) is out of jail and preparing for one last big score with his gang. Their target is a local horse race stadium during a special event, and the possible loot is more than $2 million. The group includes several employees at the venue, including the ticket taker George Peatty (Elisha Cook Jr.). When his conniving wife Sherry (Marie Windsor) learns about their plans, her scheming could jeopardize the heist. Meanwhile, Johnny prepares an intricate set-up that appears to cover all the bases for success. With his girlfriend Fay (Coleen Gray) waiting in the wings, he’s ready for anything. This heist is actually pretty simple and set up to capitalize on some creative distractions. Johnny hires a few reliable old friends to raise hell and occupy the cops. An expert marksman will shoot the prize horse, while a brute of a man will start a bar brawl. For the fight, professional wrestler Kola Kwariani uses all types of classic moves, including the airplane spin, to stun the police. His shirt also flies off to reveal a ridiculously hairy chest. It’s one of the few outlandish moments in the low-key procedural. 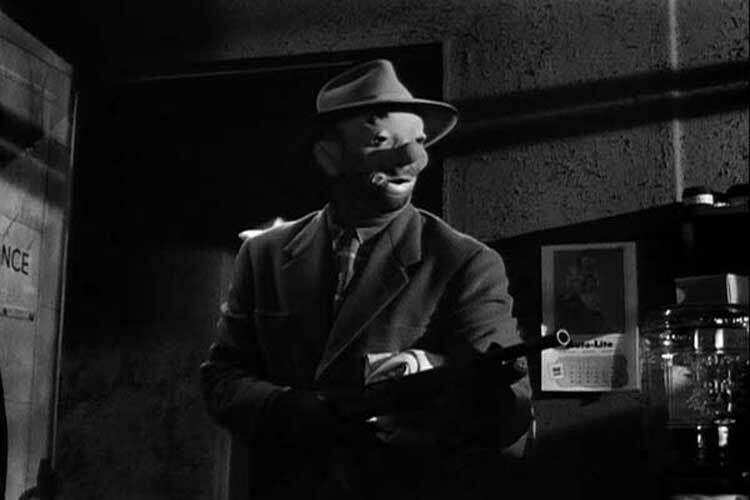 During the heist in the cash room, Johnny dons a creepy clown mask for the movie’s signature image. If each guy plays his part correctly, it should be easy sailing for the group. Of course, no plan is ever full-proof. Johnny is a likable guy and doesn’t act violently unless it’s absolutely necessary. 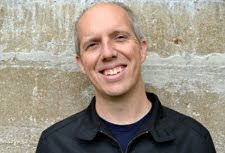 His relationship with the older Marvin (Jay C. Flippen) is touching, and he seems to care for Fay. Of course, she has to utter cringe-worthy lines about being ugly and stupid (not true in either case), so maybe Johnny’s not big on female empowerment. 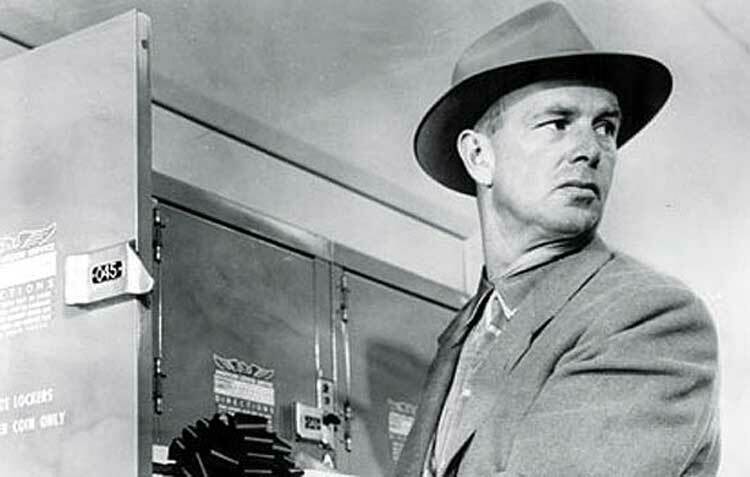 Similar to his excellent work in The Asphalt Jungle, Sterling Hayden makes us like his character through his formidable screen presence. Also known for his appearances in The Godfather and Dr. Strangelove, Hayden’s made for this type of film. 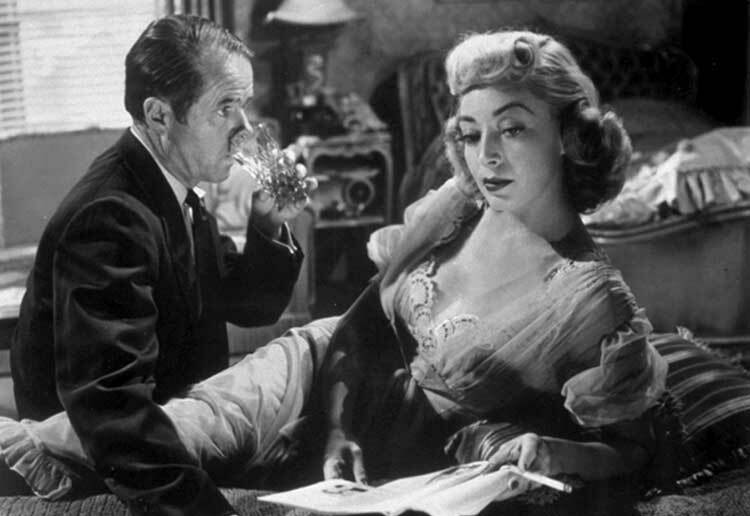 On the other hand, Marie Windsor is grating as the manipulative femme fatale Sherry, and Elisha Cook Jr. as her husband George is no better. I wasn’t rooting for these characters to grab the loot. The Killing focuses more on the process of planning and executing the heist than on kinetic action scenes, but there is one exception. Without giving too much away, I’ll just say that another guy learns about the heist and tries to claim the loot. In just a few seconds, a tense standoff turns into a stunning bloodbath. This is Kubrick’s best work in the film and is more powerful because we haven’t seen this type of fast-paced editing or violence up to this point. Another memorable scene involves a secondary player getting ready to use his sniper rifle well away from the horse race. Being friendly to the African-American parking attendant creates an unintended obstacle for the shooter. He’s forced to employ a vicious racial slur to escape this situation, which is both shocking and understandable. For the most part, Johnny sidesteps the dangers posed by Sherry Peatty and her lover Val Cannon (Vince Edwards). Of course, he does mistakenly let her live, which could be a disastrous move. Johnny’s also really lucky, which helps him to overcome some poor decisions along the way. Without giving away the ending, I’ll say that his headstrong insistence on sticking to the plan might jeopardize their success. The other guys are all following his lead, which also could lead endanger their lives. Unlike the more epic films that followed, this movie focuses almost solely on the heist and the events surrounding it. I don’t care about the marital troubles of the Peattys or the bartender’s sick wife, and Kubrick wisely just provides glimpses at their personal lives. Running a brisk 85 minutes, this story provides an excellent model of brevity that few others would follow. There’s also a clever nonlinear structure that had a major influence on recent films like Tarantino’s Reservoir Dogs. Although The Killing feels different than what we’d consider a “Stanley Kubrick film”, this structure is one example of his influence. This was 1956, however, so the studios didn’t believe audiences could follow the story without voice-over narration. Thankfully, the narrator usually only appears during time switches and isn’t too annoying given the film’s time period. I like how you've got a formula for your heist marathon in which you answer the same questions about each film. I particularly like the question, "Are the events outside the heist worth seeing," because that's a question that could be asked in many reviews of genre films. Thanks Erin! I feel like the questions format keeps me from doing a more straightforward review and helps with really digging into the movie. I appreciate the comment! I really, really enjoyed this post. I watched The Killing for the first time a few months ago, and I loved it. It ranks among Kubrick's best, in my opinion. Definitely noticed a lot of traits that influenced Reservoir Dogs, too, as you stated. Eric, I agree about the Killing, and it's too bad that it's taken me this long to finally see it. Thanks for the comment! Great recap of "The Killing". I love that you draw attention to the fact that Kubrick (and his producer James Harris) chose to tell the story in this non-linear fashion. The studio wasn't thrilled, so the pair actually re-cut a linear version of the story, but hated it. This structure exists in the source material, and it was one of the major draws to them optioning the rights to the story. So, they decided that it was a hill they were prepared to die on. The studio relented, but insisted on a narrator to explain stuff. In proper Kubrick fashion, he "agreed" - but only on the surface. If you pay attention to the narrator, you'll learn pretty quickly that he is an idiot. He routinely gets times wrong, provides inaccurate information, or is just downright confusing. So, you get a narrator, but Kubrick makes him unreliable. Thanks! Kubrick also did a similar thing (to an even further degree) in Barry Lyndon with the narrator. It was cool to see that even as far back as The Killing, Kubrick wasn't taking the obvious road.